Lot 92 at Sotheby’s London auction on December 13 is a George Daniels Millennium wristwatch in yellow gold. This is a highlight of an otherwise fairly boring selection dominated by nineties era watches. 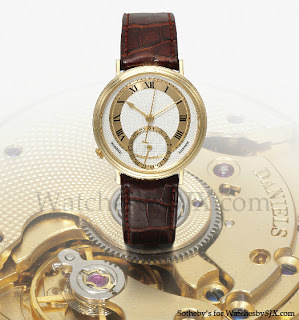 The Millennium was a limited edition of 50 pieces made in 1999 by Mr Daniels and his protege Roger Smith with a movement based on an ETA 2892. They have come up occasionally at past auctions, selling for GBP60,000 to GBP70,000. The estimate for the upcoming sale is GBP40,000-60,000. Given Mr Daniels’ recent passing it will be interesting to see what this hammers for.